Brian and I are feeling like real adults today. Last week we went furniture shopping for the first time in our married lives. Okay, I guess we got a bed a few years ago, but other than the bed everything else has been a hand me down or worse...a dumpster dive. 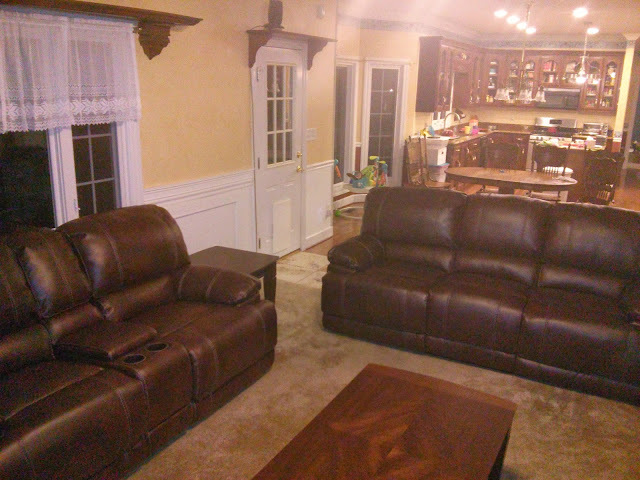 So last night when our new living room set came we were thrilled! It is definitely an improvement over the couch we had the majority of our marriage which we saved from the dumpster at Wymount. Don't judge. It didn't stink and it was leaps and bounds better than our prior couch which reaked of old person (my dad bought it from an estate sale and then passed it on to us). After using it for the last 6 years and loosing countless things in the gaping holes (including 8.5 x 11 notebooks), it was time for an upgrade. Black Friday sales are a wonderful thing (especially when you don't have to go on the Friday to get the deal. Now I think I'm going to go sit on the couch just because I can.